Of course in the E.A.T. kitchen I buy olive oil in the industrial restaurant size — you mean you don't? 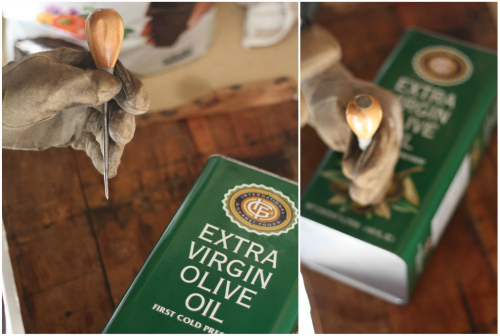 I like to buy it in bulk mainly because I use a ton of olive oil in our cooking and it really is less expensive to buy in this size over the course of time. Since the move we knew we were going to be challenged for gardening space in our new urban setting, which prompted me to find new ways to grow vegetables for our garden. 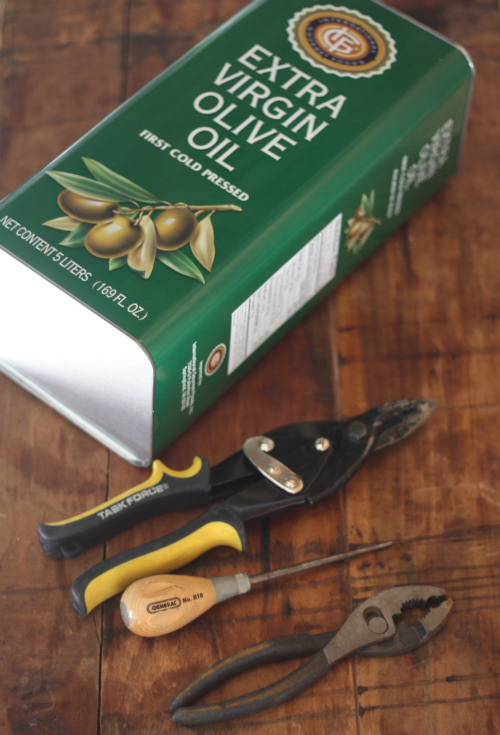 If you don't have an olive oil can this size, ask your local Italian restaurant (or any restaurant for that matter) to save a couple for you (thanks 8 1/2). Start by punching two holes long ways on the can as this will be the starting point for the long cut. 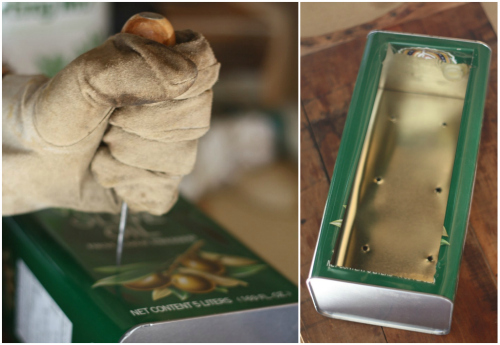 Place tip of metal cutters in holes and begin cutting along the middle length of the tin. Make sure you stop about 1.5 inches from the edge of the can. Make 2 small cuts along the width of each side of your long center cut, about and inch or two will do. This will allow for folding down "edges" as shown below. Once you have your cuts made you will need to fold the metal back to form a somewhat smooth edge to all sides of the cuts you made. Again, remember to keep your gloves on for this step as the cuts do make for very sharp edges. 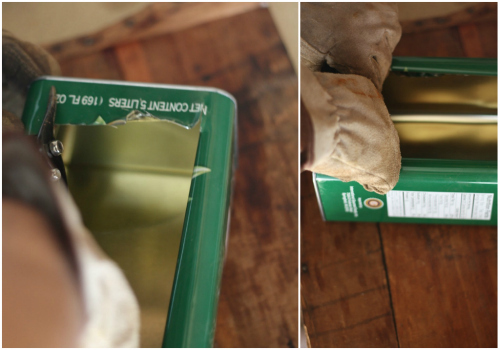 After folding both side edges in, make two more small cuts just up to the edge of the tin on each side. This will create two more "flaps" to fold down and give you that smooth edge feel. Next we will turn the can over and punch a series of holes to allow for drainage. 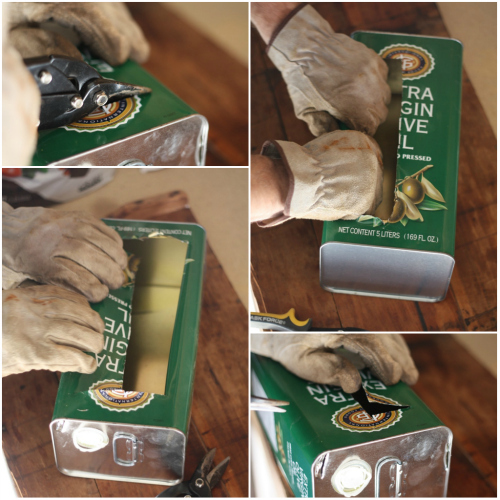 I suggest flipping the can over because when you punch the holes the rough edges will in turn be on the inside of the can. Now you've got your planter and are ready for action! 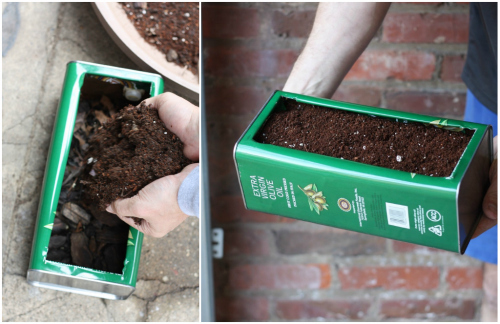 You can then line the bottom of the can with rocks or large pieces of bark mulch, again for proper drainage. 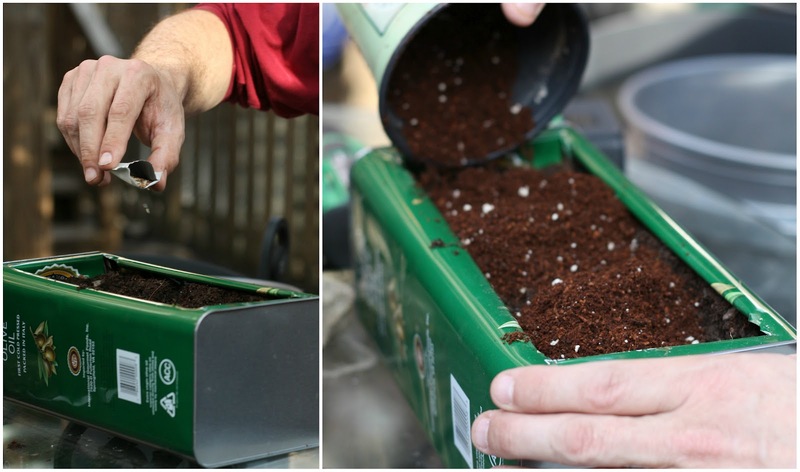 Mix potting soil with equal parts regular soil and pack down slightly. Sprinkle seeds of your choosing (I went with mixed greens) and cover with with a small layer of additional potting soil. You need to water slightly — not soaking but enough to make for damp soil. 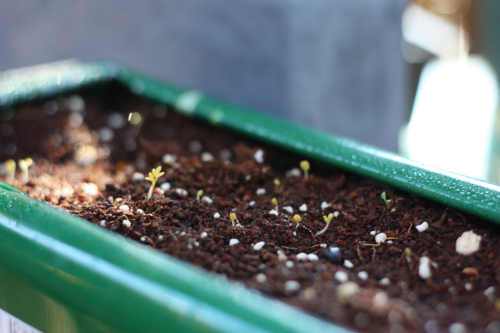 As you can see from the last picture above, I have some organic mesclun salad greens seeds already starting to sprout. I'll be sure to keep you updated on the status of these as they begin to take shape. Great idea! 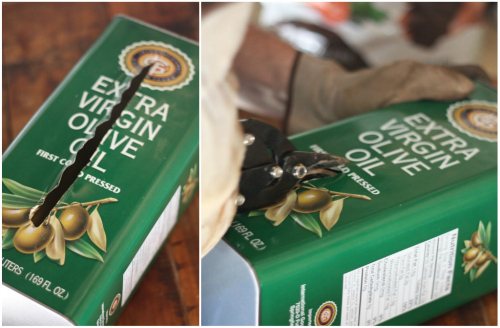 We purchase our olive oil in large quantities like that too except ours are from Costco and they're in plastic. Thanks Monica! I cannot wait until we have arugula here. There is nothing more peppery or flavorful than growing your own! This is so clever, it looks great! Thanks Mal for checking it out! 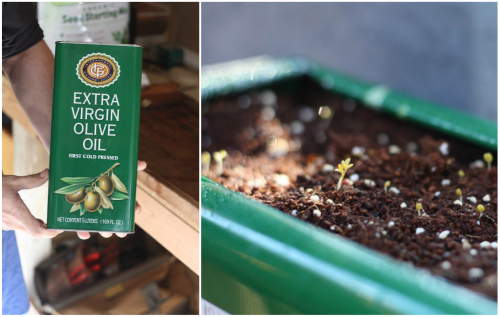 Herbs would be wonderful in the Olive Oil can!